In a previous tip, I discussed shortcuts that use the Shift key. Here I discuss a few shortcuts that use the Spacebar. With one exception, you can use the Spacebar instead of the Enter key. It’s often more convenient, because it’s bigger and because if your right hand is on the mouse, you can hit the Spacebar with your left hand. Similarly, you can press the Spacebar at the Command prompt to repeat a command you just used. The exception is when you’re using a text command, such as MTEXT or TEXT. Pressing the Spacebar, of course, just inserts a space in the text. To end the MTEXT command, you can’t press the Enter key either, because that just inserts a new line in the text. Instead, just click outside the text area or click the Close Text Editor button on the ribbon. 1. Select an object by clicking on it with your mouse. 2. Select a grip point of that object. 3. Press the Spacebar once more to cycle to the MOVE option. 4. Continue to press the Spacebar to get the Rotate, Scale, and Mirror options. If you have several objects that overlap, you may find it hard to select the one you want. This used to be a real annoyance, because you would select the wrong object, deselect it (by pressing Esc), and try again. 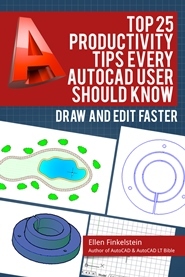 In recent releases, AutoCAD highlights objects when you just hover over them, which makes selecting the right object much easier. To use object cycling, at the Select objects: prompt, place the cursor over the area where objects overlap. Then hold down the Shift key and press the Spacebar. One object is highlighted. If it is not the one you want, with the Shift key still down, press the Spacebar again. 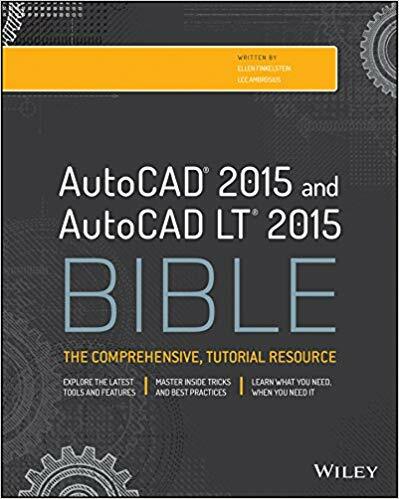 AutoCAD cycles through the objects. When the object that you want is highlighted, pick the object. If you want to select the back face of a solid, you can cycle through the faces by pressing and holding Ctrl and repeatedly pressing the Spacebar. Remember that pressing the Ctrl key selects subobjects, such as the face of a solid. A fairly new feature allows you to use the Spacebar to cycle among the three gizmos, Move, Rotate, and Scale. The gizmos help you move, rotate, and scale 3D models. Here you see the Rotate gizmo. You can select an object and the current gizmo appears on the object or you can choose the gizmo you want from the ribbon. You then constrain the direction of the move, rotate or scale operation by clicking one of the colored elements (which correlate to the X, Y, and Z axes.) Once you constrain the move, you can press the Spacebar to cycle among the three gizmos, without losing the directional constraint you specified. Do you have any other Spacebar shortcuts? Let others know by posting a comment! CTRT&Enter will close the editor. When you hit ESC in the MTEXT editor, it cancels any changes you made. Much better to click outside the editor. Spacebar for enter doesn’t seem to work on the newest edition of autocad when you use copy spacebar or any other command it just closes the command is there a setting to restore this? what is the way to make space without Enter the command.